Traditional - Style studding. Removable screw-in legs. Velvet surrounds and cord-piped edges. Traditional-style Studding. Turned Bun feet. Foot Stools are a gorgeous addition to your home. An extensive range is available. 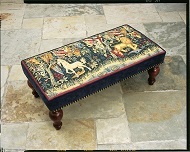 Any cushion design can be supplied as a foot stool. Contact us for more information about this product. Traditional style studding , turned bun feet. Approx 35cm x 35cm x 16cm (14" x 14" x 6") Any regular cushion design can also be supplied as s Footstool. Contact us for further information.